Produced-water storage tanks. 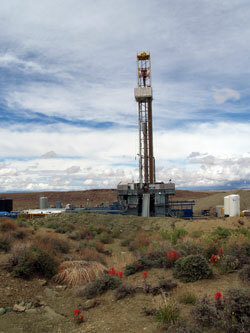 Photo courtesy of Brad Hill, Utah Division of Oil, Gas, and Mining. Create basin-wide, digital produced-water management tools. Integrate produced-water character, water disposal/reuse, water transport, and groundwater sensitivity factors to allow for quicker and more efficient regulatory and management decisions related to unconventional gas developments. Investigate the option of beneficial use of produced-water treatment for geothermal heat recovery or power generation. Promote maximized produced-water reuse which will minimize use of freshwater in unconventional gas development and production. 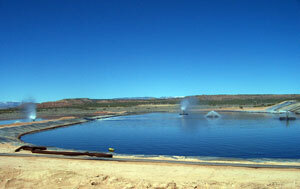 Compile Uinta Basin produced-water management practices and recommend best practices. Seek to increase protection of critical Uinta Basin alluvial aquifers. The production and disposal of water from shale/tight-sand gas reservoirs affects the economics of gas resource development and has recently become a topic of much public debate because produced water is the largest-volume waste stream associated with these unconventional gas plays. Managing produced water can be a significant cost fraction of the value of the gas extracted, so there is an economic incentive to minimize this waste stream, and/or generate revenue from treating and reusing produced water in hydrocarbon production or other applications. Managing produced water is complicated by an environment where many individual operators of varying sizes exist within a field, each with varying water needs and production, and a production timescale of decades as wells play out and new ones are completed. identifying available disposal options for unusable produced water. Deciding how to manage large volumes of produced water, whether for disposal, reuse, or energy production requires a number of major decision options. Presented at the RPSEA (Research Partnership to Secure Energy for America) Onshore Technology Workshop, Denver, Colorado, August 2015. 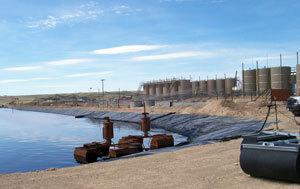 Oil and Gas in the Uinta Basin, Utah, USA: What to Do with the Produced Water? Presented at the American Association of Petroleum Geologists Annual Convention, Denver, Colorado, June 2015. Presented at the American Association of Petroleum Geologists-RMS meeting, Denver, CO, July 2014. Oil and Gas in the Uinta Basin, Utah – What to Do with the Produced Water? Presented at the EPA Oil and Gas Muster, Denver, CO, November 10, 2014. Presented at RPSEA On-Shore Production Conference, September 10, 2014. Presented at the American Association of Petroleum Geologists, 2014. Presented at Geological Society of America Annual Meeting, Denver, CO, October 2013. Presented at Uinta Basin Oil & Gas Collaborative Group Meeting July 2013. Presented at Uinta Basin Oil & Gas Collaborative Group Meeting January 2013. Thomas C. Chidsey, Principal Investigator, 801.537.3364, email:tomchidsey@utah.gov.